We just released our own Hello Pal coin – the Palto (PLT)! 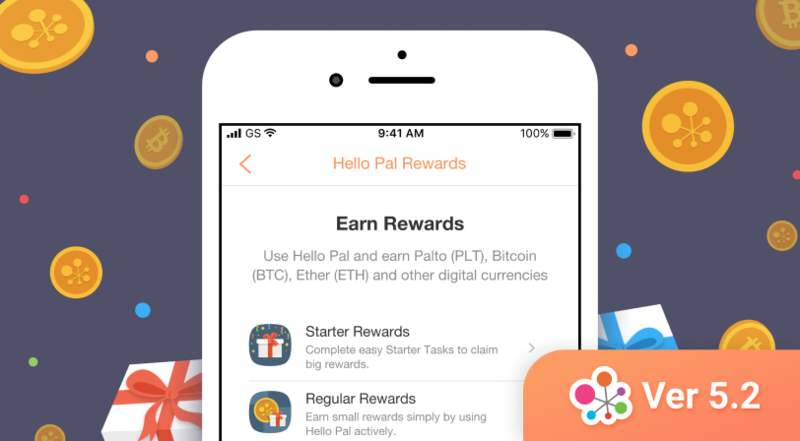 With our latest update of Hello Pal (version 5.2), you now earn rewards in the form of Palto (PLT) and Bitcoin (BTC), with other digital currencies like Ether (ETH) to come. Read on to learn more! Palto is a new blockchain-based digital coin made especially for Hello Pal users. Like other blockchain digital currencies such as Bitcoin, transactions in Palto enjoy the benefits of blockchain technology including having decentralized record-keeping. How can you get Palto? Don’t worry, there’s an EASY WAY to do that! Once you update to Hello Pal 5.2 and activate your Hello Pal Wallet, you will be able to start earning Palto (PLT) and Bitcoin (BTC) (and other digital currencies in the future) simply by using the app actively. Complete a set of easy tasks and you can claim big rewards. For example: Get a Good Trust Score, complete your Profile, start a chat with a new Pal, post your first Moment, and activate your Hello Pal Wallet. Once you’re done with those tasks, you can claim 100 PLT! If you joined Hello Pal more than a month ago, you’ve most likely done the majority of the tasks by now. Go to “Me” > “Hello Pal Rewards” > “Starter Rewards” to check what else you need to do, or to claim your rewards. Want to earn rewards quickly and easily? Just do simple tasks like using Hello Pal daily to automatically earn small rewards. Go to “Me” > “Hello Pal Rewards” > “Regular Rewards” to view the list of tasks, or check the list in this page. To check how much you’ve earned from the Starter or Regular Rewards, go to “Me” > “Wallet” and tap the “Rewards” tab of the Transaction Summary. In Hello Pal 5.2, we rebuilt the “Invite” function so you can now earn rewards when you share Hello Pal with your friends. To get started, go to “Me” > “Invite friends to Hello Pal” and press the “Generate Link” button to activate your unique referral link. After that, copy your link and send it to your friends. Once your friends sign up for our app using your referral link and they get a Good Trust Score, both you and your friend will get rewards! NOTE: Referral rewards are currently limited to registrations done through the Hello Pal app. What are you waiting for? Update to Hello Pal 5.2 now!